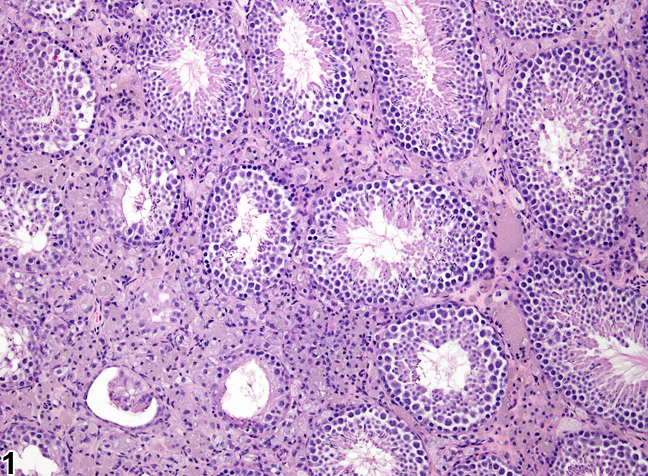 Testis, Interstitial cell - Vacuolation in a male FVB/N transgenic mouse from a chronic study. The interstitial cells contain variably sized vacuoles. 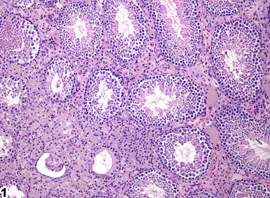 Testis, Interstitial cell - Vacuolation in a male FVB/N transgenic mouse from a chronic study. 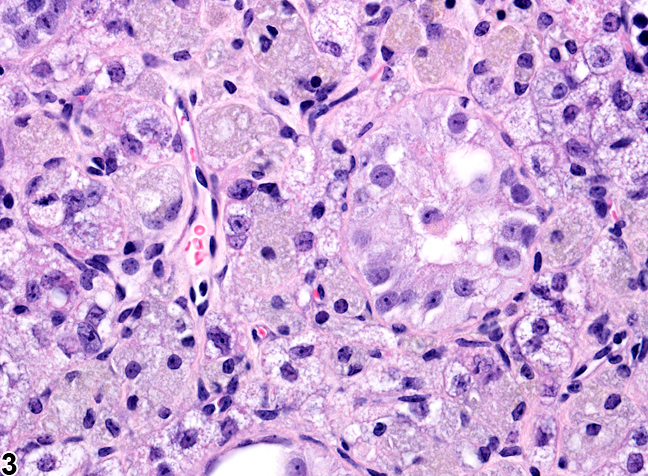 This higher magnification of Figure 1 shows the vacuolation of interstitial cells. 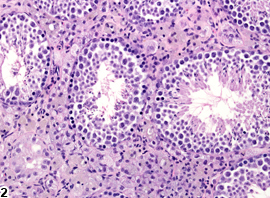 Testis, Interstitial cell - Vacuolation in a male FVB/N transgenic mouse from a chronic study. This higher magnification image of Figure 2 shows the vacuoles in detail, as well as some golden brown pigment. Cytoplasmic vacuolation of interstitial cells can be seen as a chemically induced change and most likely represents a disturbance in steroidogenesis. It generally consists of enlarged, pale-staining interstitial cells with foamy vacuolation of the cytoplasm ( Figure 1 , Figure 2 , and Figure 3 ). Syncytial giant cell formation is also present in the interstitial compartment of the testes of these mice with vacuolated interstitial cells. The transgenic mice in Figure 1 , Figure 2 , and Figure 3 were treated with ethinyl estradiol. Testicular macrophages can also become vacuolated, independent of interstitial cells. The vacuolated cells may represent interstitial cells or macrophages. These can be distinguished using a Periodic acid-Schiff stain, which stains macrophages but not interstitial cells. 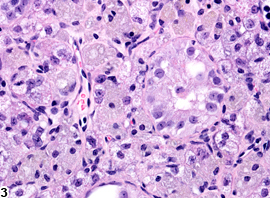 Note that normal interstitial cells of mice are generally larger and have a more vacuolated appearance than those of rats. 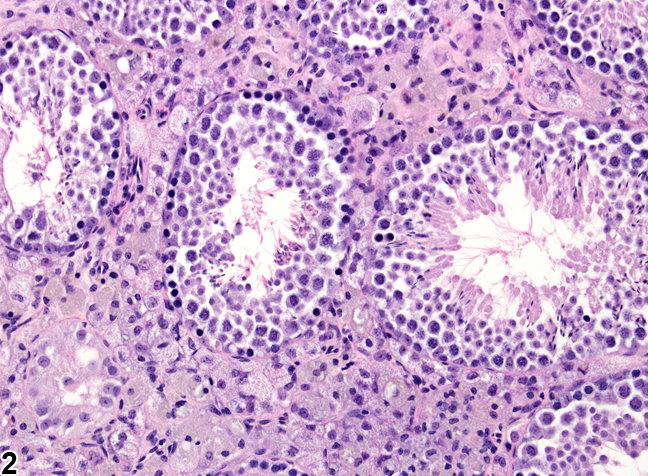 Interstitial cell vacuolation should be diagnosed and graded and should be discussed in the pathology narrative if the incidence and/or severity appears to be related to chemical administration. Diagnosis should indicate bilaterality when present.